This interview is week 11 of Sean Claes' 52 Weeks of Austin Music Interviews. 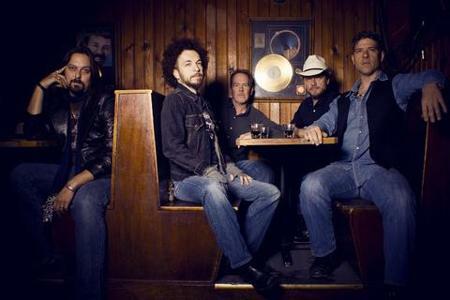 Have you had the chance to catch the latest supergroup to come out of Austin? When I caught wind that members of The Mother Truckers, Deadman, Shurman, Monte Montgomery, and Jimmy LaFave all got together and were playing Tuesday’s at The Saxon Pub and calling themselves the South Austin Moonlighters, I had to find out more. First I thought they were a jam band of friends who got together to blow off a little steam and play a bunch of covers, which would have been fine. But, when I heard they were recording an album of originals, I knew I needed to get their story. The South Austin Moonlighters (S.A.M.) are Lonnie Trevino Jr (Deadman), Phil Hurley (Jimmy LaFave), Aaron Beavers (SHURMAN), Josh Zee (The Mother Truckers), and Phil Bass (Monte Montgomery). S.A.M. is taking April off of playing at The Saxon Pub and are hitting a few other venues in the area including the Baker Street Pub & Grill (4/12, 4/26 @ 9p), Threadgill’s World Headquarters (4/14 @ 8p), and Gruene Hall (4/15 @ 5p). I had a chance to ask a few questions to 3/5 of the band. Sean Claes: South Austin Moonlighters (S.A.M.) are pretty much what the name of your band implies, a group of musicians with other projects that have come together to play. How did it occur? Phil Hurley: We were all fans of each other’s bands. But, really I credit Lonnie for starting the communication and booking the first show. Once there was a date on the books, there was no backing out. Lonnie Trevino Jr.: A year ago March all of our bands (minus Phil Bass) were performing at the ninth annual Sin City Social Club showcase hosted by Shilah Marrow. Like Phil said, all of us admired each others bands and individual talent and a genuine like for each other as people. Aaron Beavers said out loud "Man. We should all get together and just jam with this unit." I took it to heart and sent out an e-mail telling my idea for a "Resentments Type Band" to play a show at The Saxon Pub. Everyone was a little shocked and dismayed thinking this would never happen. I booked a group of happy hour shows on Tuesdays at the Saxon and the pressure was on. We had to put up or pack up. We each picked 3 cover songs we've always wanted to do and we took it from there. I called my dear friend Phil Bass who I had toured with while with Monte Montgomery. He loved the idea and jumped on board before I could finish explaining what we wanted to do. The others had never played with him before and were hoping for the best. To be honest with you this band would have failed from the get go if it were not for Phil's ability to adapt to any genre. From the moment we hit the first note it was obvious that something special was happening. Claes: When you began did you think it’d become an organized band? Hurley: Not really. It was more just for the joy of making music together. My favorite group from when I first arrived in Austin was the Mother Truckers and I was always looking for an excuse to jam with Josh. I’m so thankful to Lonnie for bringing Phil Bass into the group. We needed a drummer. Lonnie said he had it covered. What an understatement! Aaron & I were hanging out and writing together anyway. So that was just extra bonus time with one of my best buddies. Trevino Jr.: I'd say after that first month! We started offering up original tunes and taking it serious. Even rehearsals! Claes: Tell me a little about your musical background. Trevino Jr.: I moved here in '93 after I was hired by Language House (Geffen). I've went on to form a jam band called Jumbo Shrimp, formed Dahebegebees with Ady Hernandez, Joined Cadillac VooDoo Choir, Toured with Monte Montgomery, Jake Andrews, Lisa Tingle, Tommy Shane Steiner, Mike Zito, Deadman, Papa Mali and now with Fastball. I've also started yet another side project called The Whiskey Sisters. Hurley: I was part of the Boston music scene in the 90’s making records and touring with Gigolo Aunts and Tracy Bonham. I’ve lived and played in Seattle, Amsterdam, Los Angeles and Nashville since then. Touring with acts like Fountains of Wayne, Miles Hunt of the Wonderstuff and Lisa Loeb. Phil Bass: I have played and or recorded with artist such as Bo Diddly, Gatemouth Brown, Stephen Bruton, Joe Ely, Delbert Mclinton and many others" I also compose music for T.V., film and multimedia projects and do session work for independent artists. Note: Aaron Beavers (SHURMAN) and Josh Zee were not able to be interviewed for this article, but you can find out more information about them by following the links in this paragraph. Claes: How did you end up with the Tuesday residency at The Saxon Pub? Hurley: Lonnie worked with Joe (Ables) from The Saxon to make it happen. Trevino Jr.: Joe Ables & David Cotton both jumped on the idea immediately. It wasn't a hard sell. Claes: Now, you’re taking a month off of playing at The Saxon in April. What are you guys going to be up to? Trevino Jr.: We are expanding and trying other venues and traveling regionally. We will be playing once a month at the Saxon Pub and will probably do another residency in the future. We love the Saxon Pub and understand there are only just so many slots and availabilities for the time slot our fans prefer. Claes: I’ve heard you’re going to be recording or just have finished recording a CD. What can we expect from it? Trevino Jr.: We are in the process of organizing a Kickstarter page and video to raise the funds to record a proper record. It will be all original and a true studio album. Hurley: We’re super excited to start a Moonlighters record. We’ve each picked two original tunes to contribute making it a solid ten tune record. Claes: You have captured a good number of live tracks from your residency at The Saxon Pub. Any plans of releasing a CD of the live tracks? Trevino Jr.: That is also in the works. We have interest in Europe and will be releasing a live EP. Ideally we'd like to get it out there by the summer. We are still working out the kinks. Claes: Has any one player stepped forward to be the “leader” of S.A.M.? Trevino Jr.: I'd say we have all stepped up as a leader in different areas of the Business side and performance side of S.A.M. Hurley: We each have that ability. But, there’s a lot of mutual respect within the group that allows us each to have out input and ideas heard. I’ve never been part of a group that has such a strong sense of musical communication. We can accomplish so much in such a short time in rehearsals. Each guy just understands his role in the overall sound so quickly. It’s amazing. Claes: What are your favorite covers to perform? Trevino Jr.: So many to mention, I'd ask the fans what their favorites are. We get a lot of requests for "To Love Somebody" by The Bee Gees, and "She Caught the Katy" by Taj Mahal. Bass: My favorite covers that we do: “To Love Somebody,” “Night Train,” “Last Time,” “Puppet,” …really just about all of them. Ha. Hurley: I love to sing “Rolling Man” by Fleetwood Mac. And I really enjoy what Lonnie does with “To Love Somebody” by the Bee Gees. Aaron’s version of “Put the Message in a Box” by World Party always makes me smile. Trevino Jr.: Josh Zee has an affinity for 50’s rock and roll that I like. Especially the New Orleans and Elvis stuff. Claes: How are you coming with the original tunes? Hurley: We’ve started to learn how to write together. One of my favorite tunes in the set right now is one that Lonnie, Josh and I kinda created in rehearsal called “Moonlight Ride.” It’s becoming a kind of signature jam! Claes: Any danger of the moonlighting job becoming your full-time gig? Hurley: Nothing would make me happier than to see something good happen for this group. I truly love playing with these guys. I sure hope that we can get it together to do some European touring. That would be a dream comes true. Trevino Jr.: We haven't ruled out that possibility. Anything is possible. Claes: That said, where do you see the band going? Hurley: I have no idea. I just want it to stay inspired and inspiring. Trevino Jr.: We could speculate but we are just interested in living in the moment and having fun. The joy of playing with this band is hard to ignore. Claes: You’re going to be playing a few gigs this month at the Baker Street Pub and Grill. Have you played there before? What can you tell me about it? Hurley: It’s a really cool room with lots of room for listening and dancing. The sound is good. There’s no cover and the kitchen stays open until 1:30am! Trevino Jr.: We've never played Baker Street Pub. It's new, were the Old Alligator Grill used to be for many years. We are hopeful and want to try to spread the joy around Austin. Claes: Looks like you’re playing a Sunday evening at Gruene Hall on April 15. Will this be the first time the band has played there as a unit? Trevino Jr.: It will be the first time this Band performs there. We are very excited. I've always have had a great time playing there. Can't wait to play there as S.A.M. Hurley: I reached out to Tracie (Ferguson) at Gruene Hall. Stonehoney had a special relationship with that room. I am so honored that they are trusting in us and giving us a chance to get something going down there in that historic room. Is there really any place cooler than Gruene? Claes: You’re also playing Threadgill’s on Saturday April 14. How’d that gig come about? Hurley: Threadgill’s has been a mainstay for most of our groups and one of my personal favorite venues in Austin. That’s family to me here in town. We’ll have our sister group, The Whiskey Sisters, opening the show. That’s going to go off! Trevino Jr.: That is going to be a great weekend! Claes: Is there anywhere you’d like to play that you’ve not yet had the chance? Hurley: Yeah, sure. I wanna play the new Moody Theatre, The Ryman Auditorium, The Hollywood Bowl, Royal Albert Hall and Madison Square Garden. In that order! Trevino Jr.: So far so good. We've been offered several gigs at many well known venues. We don't want to jump the gun too quickly and jinx anything. Trevino Jr.: I've traveled all over the world and think that Austin Texas is by far the best Music city in the World. The problem is the City and the residences naturally take it for granted. I've been guilty of that as well in the past. I encourage everyone to find a venue and patronize the heck out of it, find a band and support the heck out of it, create a community that supports the heck out of the arts in this town. Being a Musician as profession is not taken seriously by a lot of people in this town who want and expect music, and the performance of music, to be free. The economy has been on the rise and yet musicians haven't given themselves a raise in 40something years. Be kind and show support for the biggest reason folks visit and end up staying in this town, the live music. Hurley: If you haven’t come out to see this band yet. Do yourself and favorite and come on out. It’s the most fun you can have with your clothes on.